Will I ever really belong to this country? As a Chinese Australian? As a non-Indigenous Australian? . . . I was 32 years old and barely knew the country of my birth. It was time to change that.' What happens when a 32-year-old first-generation Australian woman decides to chuck in... read full description below. Will I ever really belong to this country? As a Chinese Australian? As a non-Indigenous Australian? . . . I was 32 years old and barely knew the country of my birth. It was time to change that.' What happens when a 32-year-old first-generation Australian woman decides to chuck in a dream job, pack a sleeping bag and tent, and hit the long, dusty road for six months? Thirty-thousand kilometres later, Monica Tan has the answer, and it completely surprises her. In mid-2016, Monica left Sydney, unsure of her place in Australia. As a Chinese Australian city slicker, she couldn't have felt more distant from powerful mythologies like the Digger, the Drover's Wife and Clancy of the Overflow. And more importantly, Monica wondered, how could she ever feel she truly belonged to a land that has been the spiritual domain of Indigenous Australians for over 60,000 years? 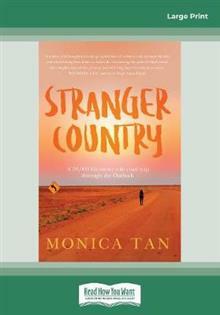 Stranger Country is the riveting account of the six months Monica drove and camped her way through some of Australia's most beautiful and remote landscapes. She shared meals, beers and conversations with miners, greynomads, artists, farmers, community workers and small business owners from across the nation: some Aboriginal, some white, some Asian, and even a few who managed to be all three. The result is an enthralling and entertaining celebration of the spirit of adventure, a thoughtful quest for understanding and a unique portrait of Australia and all it means to those who live here.